Pretty much what the category says, random thoughts, rambling, ranting, and usually at least attempting to be somewhat funny. This started out to be a piece called “Why High Heels Should be Banned,” but titles are tricky and it’s important to get a good one. So I thought about what I really wanted to address with this post. And while I would sort-of like high heels to be banned, I decided that even more than that, I wanted to complain. And if it serves as a cautionary tale to anyone to not wear high heels that would be a bonus. Actually, if anyone other than me reads this it will be a bonus. Everyone knows your eyesight gets worse. Especially close up vision. We all know about “cheaters” (The glasses, not the rotten spouses. If you know firsthand about them, sorry. But I digress.) What I didn’t realize is that you also need more light to see as you age. I first noticed this while driving at night. And I was so clueless about it being an effect of ageing I actually took my car in to the shop and told them there was something wrong with my car’s headlights. The mechanic said, “Oh we’ll just re-aim them. Sometimes headlights need to be adjusted after a while.” And I thought, “Good. That’s sorted.” But when I picked up the car the young mechanic seemed puzzled when he told me there was nothing wrong with the lights. Another thing I didn’t realize about ageing hair, or rather one’s hair as one ages, because hair itself is dead. (Don’t think about that too much, or it becomes a bit disturbing.) Anyway, what I didn’t know was that my hair would get thin. Even my eyebrow and eyelash hairs. Really God? Really? Eyebrows? I spent so much time and energy in my teens and 20’s trying to restrain my eyebrows. Now I’m painting them in because they have become so sparse and light. Or have migrated to my chin. -Business women, and others who have to get stuff done, pack and carry around extra shoes they can actually walk in. -Women on tv news and talk shows, sitting with their stilt-shoes, talking about equality, when they can’t even walk down the block or run from a fire. And what about all those dumb women in horror films who can’t escape the sensible-shoe-wearing hatchet murderers? I suspect one day anthropologists will dig up evidence of our society and honestly not understand what was going with all the bathroom debates and Kardashians and reality tv shows. And they will wonder what type of society tortures its female population by forcing their feet into these pointy, stilted devices. Anyway, back to my traitorous toes. I don’t have gross, thick, yellow toenails – yet; still looking forward to that. But recently the second and third toes on my right foot are starting to act like annoying, middle school girls. They are staying as far away each other as possible and instead making bffs with the toes on the opposite sides. Besides looking weird and twisted it also hurts. So, I looked on the internet, asked friends, bought 13 different types of foot and/or toe pads at the drug store and finally asked my doctor about it when I was in for a totally unrelated reason. She knew exactly what to do. Make an appointment with the podiatrist. When I got there, the first thing he told me he wouldn’t judge me for wearing flip-flops. I was a little bit put off by this, because I was wearing good flip-flops, the ones with a little arch and lots of cushion. I seriously considered giving him my rant on high heels, but decided to hold off for now. After all, he might be charging by the hour. So, after a brief examination he concurred with google. I had the beginnings of hammer toes. His treatment consisted of giving me a type of toe/foot cushion that wasn’t carried by the drug store, and told me I would eventually, probably need surgery. But not until the balloon payment on his yacht was due. Ok, maybe I made up that last part. So, I went home with my new toe/foot pad and it helped, sort of. Then the following week I got his bill for $17,541.23, or something like that. Because the health insurance industry in America is the devil. For those of you who don’t know what NaNoWriMo means (National Novel Writing Month) you don’t need to worry about any of this. Continue happily on with your sane lives. But for any of you out there who have accepted the challenge of writing a novel of 50,000 words in 30 days I have compiled some advice from well known authors to help (and by ‘help’ I mean, ‘not help at all and marginally harm by distracting’) you through your odyssey. Nothing’s a better cure for writer’s block than to eat ice cream right out of the carton. So, to those of you making the attempt I wish you all the best! I can certainly use this today. 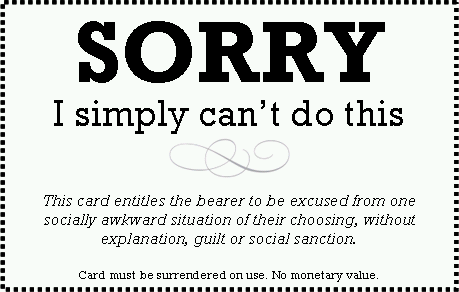 And here it is for you, just in case you need it too. Well, like a true nerd (which I claimed to be in my “About” blurb) I had to make a pi pie today. 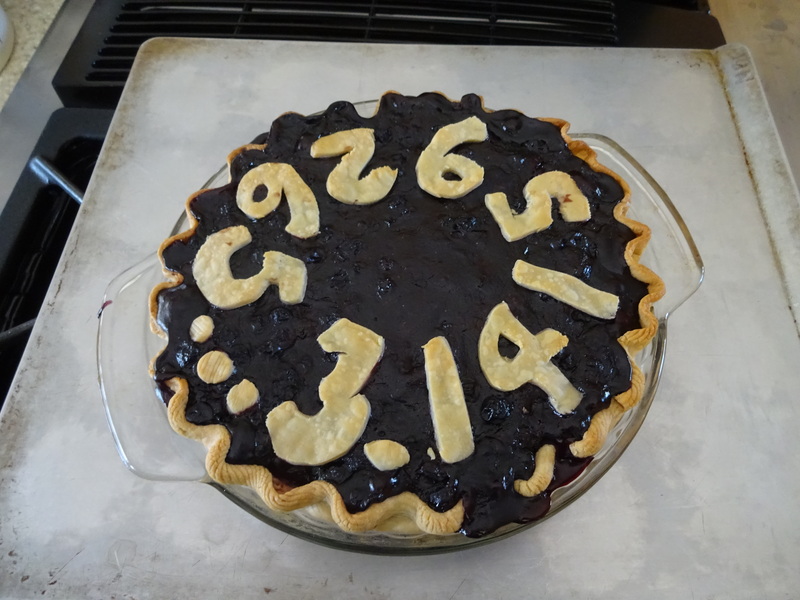 Here is the result, a blueberry-cherry pi pie. If the letters look a little goofy, because they are… hand crafted – yeah, that’s what I’ll call it. Anyway, I wish you all a sweet (or savory) Pi Day! I will be the first to say I’m not very techie. I don’t deny it. If there was a 12-step group I’d stand up and admit it to all assembled. Admitting the problem is the first step in correcting it, right? But it’s more than just that – really. I have this superpower (well, two actually, but one is choosing the slowest moving line in any store, theatre, etc., and we can discuss that another time). But the superpower related to this little rant is my ability to foil technology, which is why technology hates me. And yes, I have evidence. The cell tower hundreds of yards from their homes was more dangerous to them than the phones they held against the sides of their heads most of the day, and would give them cancer, decrease their homes’ property values, and make their teeth fall out. Or something like that…I’m fuzzy on all the details of their arguments. But the final result is the same. Cellular telephone technology hates me (and maybe my neighbors do too). Another example of a technology that hates me is the coffee maker. I may not be very techie, but I can make coffee. At least I could… until Christmas last year. I received a Keurig rapid, single cup, hot beverage brewing/dispensing system. It all started well. I managed to get the coffee maker out of its hermetically sealed packaging and set up on the kitchen counter before Boxing Day. I read the instructions, which told me that besides buying little, plastic overpriced individual coffee “kups” to use in the Keurig rapid, single cup hot beverage brewing/dispensing system, I also needed to buy bottled or spring or water. Unfortunately it was winter, not spring, so I opted for softened water, which was also acceptable, but sort of looked down upon (like sending your kids to Hogwarts in hand-me-down wizard robes). Anyway, after setting the brew kup size, time, date, temperature, barometric pressure, average wind speed and number of cats in the household I was ready to brew my first kup of coffee. Let me tell you, it was wonderful. And so was the second kup. But, the following morning, when I was half asleep and really in need of a good kup of coffee, once again technology failed me. Or I foiled technology. After swearing at, apologizing to and pleading with the Keurig rapid, single cup hot beverage brewing/dispensing system, I read the troubleshooting tips in the booklet that came packed with my Keurig rapid, single cup hot beverage brewing/dispensing system. It suggested I first unplug the coffee maker, wait 97 seconds (or something like that) and plug it in again. After doing that four times (because I’m not good with technology, and maybe I didn’t do that quite right) I moved on to their next suggestion: clean the hollow needle that stabs into the coffee kup with an unbent paperclip, in case coffee grounds have plugged it. I sacrificed 6 paperclips and two fingers doing this to the best of my ability before finally giving up and calling the toll free number found in miniscule writing in a tiny corner on page 23 of the instruction booklet. Surprisingly, they were, “experiencing heavier than usual call volume at this time,” so I waited about 35 minutes before Jason asked if he could help me. But first I had to find the serial number affixed in microscopic hieroglyphs to a recessed spot at the lower edge on the back of the machine. After several unpluggings and paperclip cleanings under expert direction, it turned out I had indeed killed the Keurig rapid, single cup hot beverage brewing/dispensing system, and Jason said he would send me a new one in seven to 10 business days. In the meantime, I probably needed to buy some Redbull caffeine laced energy drinks. But finally after about 8 business days and two weekend days I had my shiny, new Keurig rapid, single cup hot beverage brewing/dispensing system. This one lasted a full two weeks before I had to call Paul at customer service. When he asked how he could help me I told him he could get me a damn cup of coffee. He did not get me a coffee, but eventually we came to the conclusion that I had again destroyed this epitome of modern, coffee-making technology. Perhaps this second Keurig rapid, single cup hot beverage brewing/dispensing system somehow knew that I had destroyed the first one, and was bent on revenge. Or perhaps I once again foiled modern technology. Anyway, eventually Paul sent me yet another Keurig rapid, single cup hot beverage brewing/dispensing system. This one is still making my coffee each day, fingers crossed, knock wood, etc. But only after several weeks of caffeine-deprived hell. My most recent example of how technology hates me comes from the Fitbit popular brand, activity tracker I just purchased. It’s a great activity tracker, intuitive and easy to use. Any idiot can work one. So, my cute little Fitbit popular brand, activity tracker arrived in the mail from Amazon a major online retailer. I struggled a bit, but eventually managed to get it out of the packaging. The simple step-by-step instructions to set up and sync it were pretty straightforward, but being left-handed, I went backwards and only found them after I was done. Still, it was easy enough that I managed anyway, only taking about three times as long as the average Bonobo. The Fitbit popular brand, activity tracker was working swimmingly until the morning of day three (and yes, I did heed the instructions to not take it swimming). This particular morning my Fitbit popular brand, activity tracker would not sync to my computer. I tried three times for good measure, because as we all know, I’m not good with technological innovations. Then I got my coffee and tried again, because coffee helps everything (and I thanked the heavens the Keurig rapid, single cup hot beverage brewing/dispensing system was still working). But the Fitbit popular brand, activity tracker still would not sync. I went to the online troubleshooting site and tried all their suggestions several times, to no avail. Then I went to the online community forum and spent an inordinate amount of time reading, deciphering and trying their suggestions. I even resorted to the number one cure-all – I turned my computer off and back on. But when it did not sync, I knew I was sunk. Finally I swallowed my pride and found a phone number that would connect me to a live, human Fitbit popular brand, activity tracker employee who could tell me the one, obvious thing I didn’t do. I didn’t even have to wait that long on hold, when Aggie asked me how she could help. In the end though, it turned out the only way Aggie was able to help me was to send another Fitbit popular brand acitvity tracker. Something actually went wrong with the device. I was not being inept, once again, technology hates me. I have lots more examples of this, but let’s face it, I’ve already rambled on quite a bit, and you’re getting antsy, ready to go on to the next blog. Or maybe even go out and exercise or make yourself a cup of coffee or phone a loved one. Well go on then, and enjoy it, because technology is probably your friend. But now you know I have good reason to believe technology hates me. *NOTE: While the above is entirely true it may not be factually accurate in every detail, which is why I have omitted (sort of) using any brand names. So I start out with my coffee and my Otis and a manuscript from a friend who asked me to read and give feedback. When I start reading I feel immediately guilty/envious, because I should have hundreds of pages of my novel written, but no. So, I mentally flog myself for a few minutes, then begin reading and scribbling comments till Hubby wakes up. Then we talk for a bit, he goes to work (poor him) and I get more coffee and start my computer. I’m about to begin writing that blog post, but first I have to turn on yahoo chat, just to see if my friend from China made it back yet (she was visiting me in DC last week). And I’ll quickly check my email and facebook. I’m only going to check facebook for important messages, but of course I get sucked into reading posts, finding that my chakra is third eye, and the dog I am most like is a bulldog. And of course I have to watch the video of “Pilates for wine drinkers”, because I drink wine and do Pilates. And my friend from China is back, and she’s online, so I have to say hello and see how her trip was. Then, noting (thanks to my fb feed) its Anais Nin’s birthday, I look up some of her poetry. Wow, she’s amazing. But, back to the blog. Oh – the little star in the corner is orange! Some activity! So, look at that, comment back to that person. Then see something interesting in their list of blogs they follow, and check it out. And it’s a travel blog, talking about Airbnb, so I spend half an hour looking at places in Sedona and Santa Fe for the trip I want to take, someday. Now, on the third cup of coffee, I’d better go to the bathroom! (Ok, maybe that doesn’t deserve an exclamation point, but I digress.) So, once in the bathroom I look in the mirror and think to myself, “Self, you should shower.” So I do. And then I moisturize, ‘cause I’m not getting any younger. And then I look at the floor, and hmmm… it’s a small bathroom so it doesn’t take long at all to wash up the floor. And I might as well clean the rest of the bathroom while I’m at it. Ok, so that’s done. And now it’s after 10:00. I really should get dressed, even though it’s the weekend – just in case anyone comes over; though no one ever comes over. But if I don’t get dressed this will be the one day someone comes over. And then Otis needs to go out. And I really should take him for a walk. So I do. But now – now I will sit down and write. And here I am at the kitchen table with my laptop, but I look over and see the counter hasn’t been wiped off. That just takes a second, so I quickly do it. And then I go through the mail sitting there. And there is a receipt that should go in the tax folder. I have to do that now, or it will get lost. Ok, and I’ll just put the coffee cups in the dishwasher and start it. And I’ll wipe the sink, and maybe just sweep up the floor, there always seems to be a bit of dog hair and a few crumbs. And it just sort of keeps going like this. Which is why I have nothing written for my blog today, but next week when I’m having friends over for dinner with the house a mess, and the food half prepared, I’ll have a brilliant post for you!